A Daily Diary: First Publish in the Neopian Times! First Publish in the Neopian Times! I shuffled over to the ramshackle farm land just outside of Altador, clinging my fingers into my sweaty palms. I didn't know what to expect. I only heard rumors about the average sweet plushie Poogle whose personality transformed over night. Coos turned into cackles. Gentle thuds into grass became pounces so rough that every landing of every leap crumbled the grass and dirt beneath her feet. She always smiled, I heard. A sunny grin sharpened over the course of a single and frightful night, like the razor teeth she bore. It scared the locals enough to draw everyone, including myself, here. But no one dared enter that gray house on top of the hill where she remained, alone and howling into the night. Her owner had no idea how it happened. I asked. Her only answer was held in her shaking lips as her glass of tea vibrated in her hand, spilling carelessly all over the floor. She told me one thing. She would approach Shontriel if she only knew it was safe to do it. I think she wanted to love Shontriel, really. She was so close to her once, they were thick as thieves. But she feared her change. Judging by her own fears, I started to get a little nervous. What did she do to make the town so afraid? I reflected on her owner's odd behavior as I approached the fence. The cool wind picked up, blowing stalks of hay loosely standing nearby. There was nothing here except a freshly painted gray house, illuminated by the afternoon sun. My hand quivered as I pushed the gate open. My heart raced heavily in my chest. I curled my lips and took a deep breath as I walked through the grassy pasture up to the home. When I reached the door, I knocked, lightly. My hands were so shaken that they could barely move, let alone have the strength to rap on the door and face my fears. "Hello?" I said, quietly. The whistling sound of the wind raised in my ear. Should I have had the brashness to walk in? It was only... a Poogle. Harmless, right? For all I know, something could have been wrong. I had to go in. I turned the brass knob with ease as I shoved the door ajar. For the brief moment, I smiled widely and sighed. I pushed the door open as the sound of its creaks vibrated in my ear. I was surrounded by pitch black darkness. It didn't make me feel better. In fact, it only brought back to reality exactly what I could be dealing with. "Is anyone here?" I said, aloud. My lips curled inward. "DON'T SAY THAT! WHY WOULD YOU SAY THAT?!" I shouted inside my head, as I crossed my arms. A shuffling of hay on the ground stirred every hair on my body. It grew closer. I heard heavy breathing, like the sound of rolling gravel, move towards me from behind. Something rough and soft brushed back and forth across the hand at my side. I looked down. Two large red eyes illuminated the yellow cotton fabric skin of the msp. I half-seized a gasp as I watched this gentle creature run her head against my hand, bearing her sharp toothy grin widely. I sighed with relief as I knelt down and held her. She was softer than a cloud as she laid, with acceptance, in my arms. Her insides vibrated as she purred, making the sounds of rolling gravel I heard earlier. Then they slowed as she lulled into a soft sleep. I didn't get the experience the locals feared but I did get to lay her down on a large pile of hay and watch as her thick tummy rose and fell with serenity. Her red eyes closed and darkened the area around her. Her soft head tossed and turned as she whistled through her nose, as if to snore. She seemed so peaceful. Two paws clutched a torn blue Knight Moehog plushie, like a child. Her pet pet Mazzew curled up at her feet and purred in her sleep. At the same time, I pitied her. Because of her change on the outside, everyone, including myself, feared her. Yet, inside she was the same sweet Poogle she always had been. She must have been so lonely these past few months. I had every intention of coming back. And if anyone had any more doubts about what she is, I'd tell them to read this story. 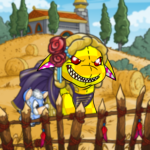 As I left the gate, Farmer Cortes, the blue Kacheek who worked these lands, approached me with a wide smile. He shook his head. "I haven't been in there since it happened," he said. "There's been a lot of stuff I need up at that house and can't get to it because---well, let's just say I'm glad you're here." "You've come to take her away, haven't you?" he asked. My eyes hardened a little as I took a step back. I looked back at the house and thought about the lonely MSP in there, longing to be cared for. "Yeah," I said, "I have. You oughta know something else." "If you knew what an amazing and sweet pet she was... is and always will be, you would never want her gone. Even if you won't miss her, I know she's gonna miss you." His mouth hung open, unable to speak. "Excuse me," I said, as I walked past him with a thin smile on my face. "That should put him in his place," I thought, proudly. I looked back to see him stare up at the house, his hand on his hips as he gazed up. My heart softened, wondering if he was pondering the words I said. "Would you like to say goodbye?" I said, placing my hand on his shoulder. "Yeah," he said, gulping as a tear came down his face, "I would." I knocked on the owner's door and waited. No longer shivering with fear and nerves, but excitement and anticipation. She readily opened the door and invited me in. "What did you find out?" she asked. "She's barely changed," I said, as I sat down with a hot up of Borovan. She didn't move, stunned. "How can that be?" she asked. I said, "Outwardly, we both know she is no ordinary Poogle. She's special now. Brilliant, even. I honestly never met a kinder neopet in my life." Her mouth still hung open. She said, "But how can that be? She's--"
"An MSP," I said, "Yes, I know. I don't care how she got that way but she is... who she is now and I wouldn't change it for anything." "I will be forward," I said. "If you feel comfortable enough, you can keep her and visit her as often as possible. But if you are still unsure, let me take her and give her a real home." "I think you've changed my mind. You're known for your honesty, too," she said. "But anyone who loves her as much as you do deserves her. She deserves you." On that day, I wrestled her up in my arms, as she laid asleep, and took her home. Instead of a pile of straw, she lies, with her Mazzew and her torn blue Knight Moehog Plushie, on a soft fur rug by a warm fireplace. Every day we play fetch, travel, and read stories along with her brothers and sisters here at home. She's simply... happy. The editor changed a few things, grammar wise, which kinda made me frown since for a bit I didn't recognize my own writing. Such as turning the word 'brash' into 'brashness.' etc. But I'm overall thrilled. I wrote a new one last night and sent it in and I'm hoping it makes it!! WOOT! They even used my pet image ^.^ Which was faboo.